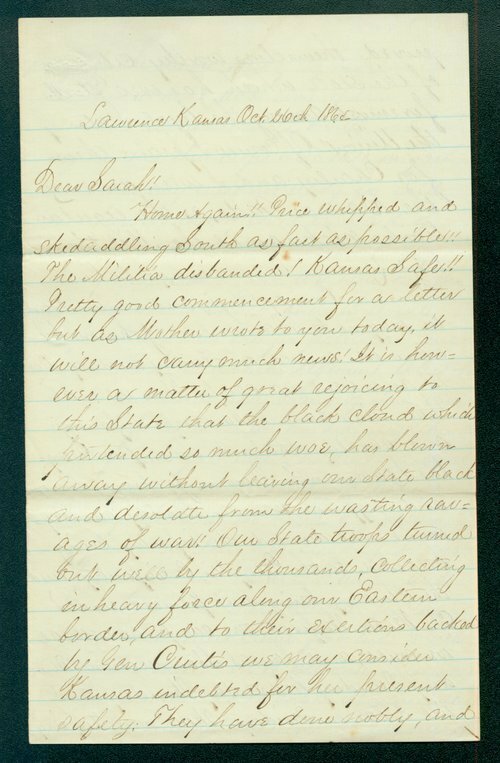 This letter, written by William R. Brown from Lawrence, Kansas, was addressed to his sister Sarah Brown, who was away at a teaching position in Massachusetts. William described his role as a soldier in the state militia during the Battle of the Blue and the Battle of Westport and rejoiced in the Union victories there. He also discussed the emotional state of the troops, of whom he says many were at first unwilling to fight and were a "disgrace to Kansas." William related news about the battles and the ultimate defeat of Sterling Price and the "rebel" troops, who were forced to retreat south. William also mentioned riding a railroad line back to Lawrence.